ANTaR ACT – ANTaR ACT is the local branch of ANTaR – Australia’s main non-Indigenous organisation for reconciliation. 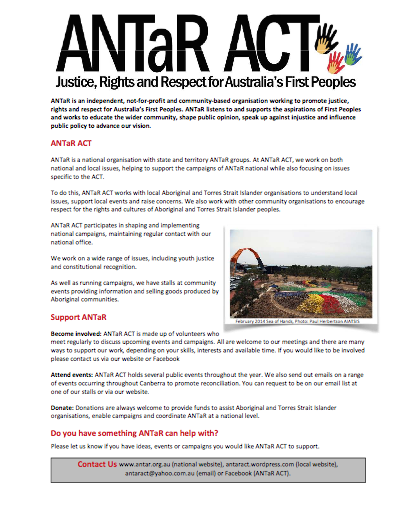 ANTaR ACT is the local branch of ANTaR – Australia’s main non-Indigenous organisation for reconciliation. We’re dedicated to supporting the rights of Indigenous people through public campaigns and advocacy. There are many ways to support the rights and aspirations of Aboriginal and Torres Strait Islander people, depending on your skills, interests and available time. Contact us if you want to find out more about supporting reconciliation in the ACT: by email at info@antaract.org.au or by joining the conversation on Facebook. ANTaR ACT has a collection of ‘hands’ in six colours, which are suitable to prompt discussion of reconciliation and recognition. If you would like to borrow our hands for an event or learning opportunity, email us at info@antaract.org.au. For an example of how the hands have been used previously, please refer to the 2014 ANTaR ACT newsletter (under ‘Publications’) which features an article about the successful ‘Sea of Hands’ installation in February 2014 to celebrate the sixth anniversary of the National Apology and the 50th anniversary of AIATSIS.